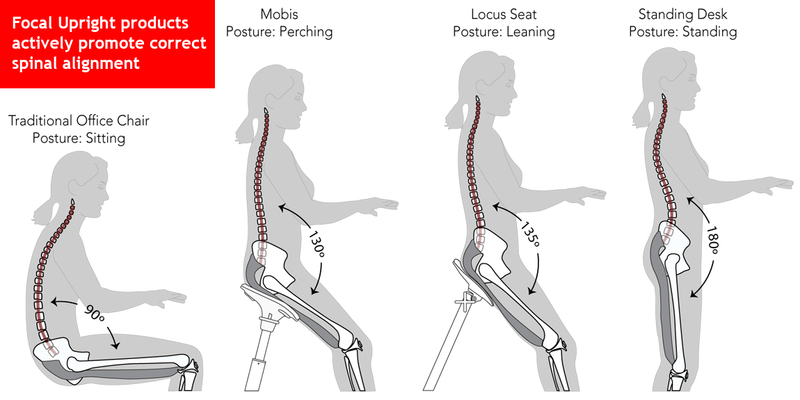 Promotes Correct Posture - Like its 'big brother' - the Locus - the Mobis Seat provides a 'forward tilt' on the pelvis which naturally encourages the 'S-curve' necessary for proper spinal alignment (see image in gallery). This positions the head over the spine, ensuring that the back can provide the necessary support without fatigue. This also encourages a noticeably more upright stance, with a reduction of the forward bend of the neck. By combining the Mobis Seat with a correctly positioned monitor the head can be properly supported over the spine. Not only is this a relaxed position, it is also healthier and places less strain on the muscles of the neck and upper back. 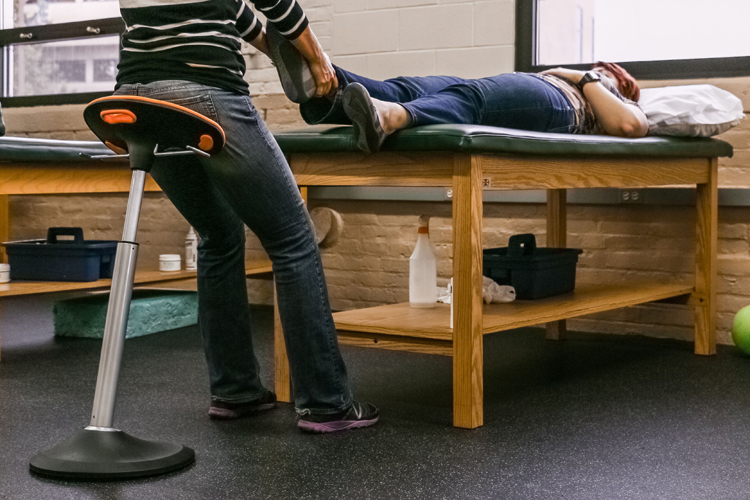 Reduces Weight Load on Legs and Feet - The Mobis Seat enables users to transfer 60% or more of their weight from their feet to the seat, thereby reducing the pressure on the joints of the lower limbs. This translates into reduced risk of damage to the knee and hip joints (which can occur when these joints remain under continuous strain from standing on hard surfaces). 'Active Working' Dynamic - The Mobis Seat offers a unique pivoting feature which encourages users to actively move their body throughout the day. This movement can benefit the entire body as it will exercise core muscles in addition to the muscles of the legs. Flexing of the muscles of the legs is difficult when in a traditional standing position and can lead to swelling of the lower legs (edema) as blood and fluid collects in them. Relaxed activation of those muscles is encouraged by the Mobis Seat as the user shifts position and uses them to provide balance throughout the day. Although minimal, this minor flexing aids in moving fluids back into the circulatory system. Promotes Health of Spinal Discs - The 'Active Working' referred to earlier also has a positive impact on the spine. The continuous movement creates a 'pumping' action within the spinal discs. This action aids in drawing nutrients into the discs and expelling waste, resulting in healthier discs. Improves Internal Organ Activity - The Mobis Seat promotes a 130º Open Core Stance which reduces pressure on the internal organs. This means easier and deeper breathing as the lungs are no longer compressed and the diaphragm is not restricted. In addition, this stance and the resulting increase in movement also encourage a more active digestive tract and improves overall circulation. Reduces Risk of Lower Back Pain - For many people, standing in a static position for extended periods with the feet flat (such as at a standing desk), can lead to lower back pain. The muscles of the lower back are able to relax when the Mobis Seat is used to carry the weight as users lean on, or 'into', the Mobis. Expands Comfort Zone - The upright stance provided by the Mobis Seat, combined with the 360º pivoting and 12º tilting range of the seat, offers users an extended reach which cannot be achieved with fixed leaning seats. 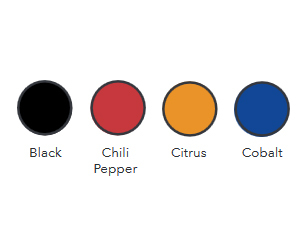 This expands their comfort zone, providing access to a larger area of the worksurface while at the same time reducing the risk of overextension. Decreases Neck Rotation - The pivoting and tilting capabilities of the Mobis Seat provide users with a range of movement which traditional seating (chairs, stools, etc) cannot provide. 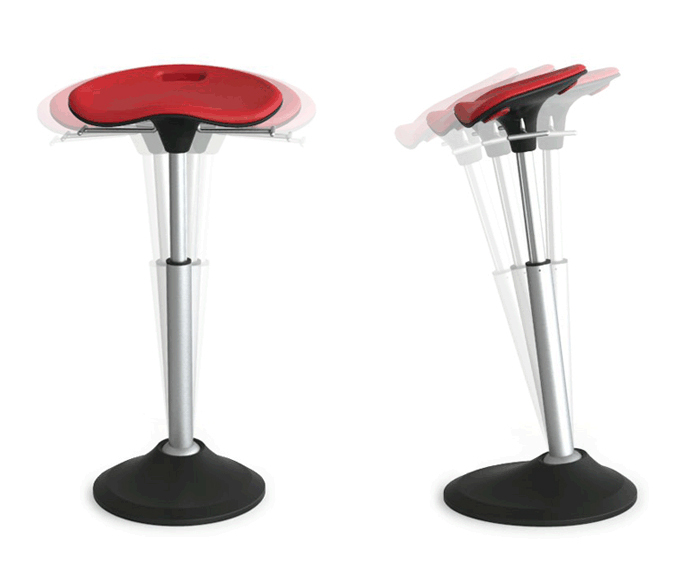 Rather than relying on neck rotation to view to the sides, Mobis Seat users can rotate their entire torso since the seat freely rotates with body movement. Unique Pivoting Base: The seat on the Mobis is mounted to a pivot base which enables the seat to freely follow the movements of the body as users shift their position throughout the day. This ability to pivot encourages continual movement which triggers repetitive core muscle activation as balance is maintained. Adjusts to Fit the User: The Mobis seat is height adjustable within a very wide range (25" - 35") which enables it to accommodate users ranging from 4'11" to 6'8" tall. 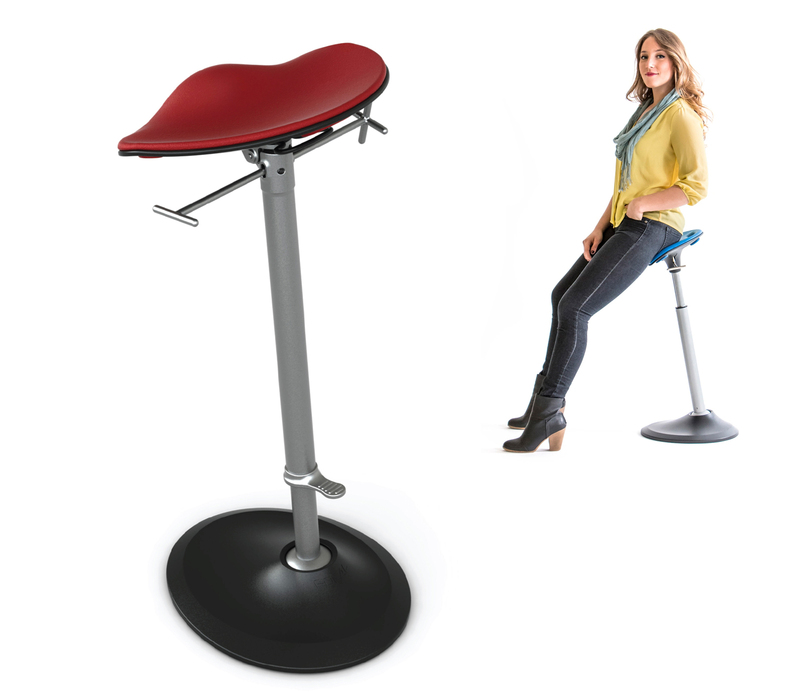 Comfortable: The seat pan is naturally contoured, providing secure and comfortable positioning for all users. The seat cushion offers just the right amount of padding and is easily removed for cleaning should the need arise. 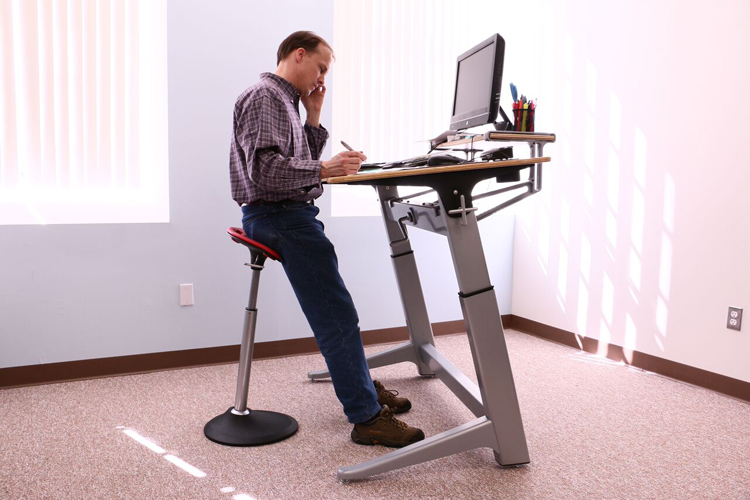 Universal: The Mobis Seat can be combined with any Standing Desk or Height Adjustable Worksurface. 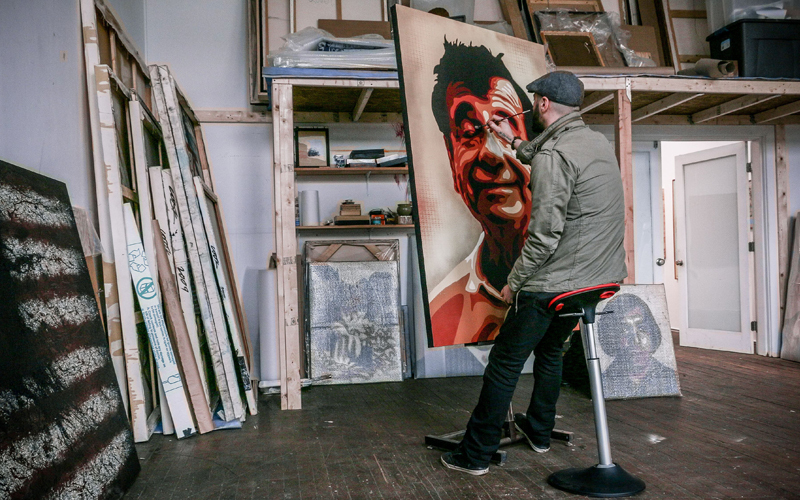 Portable: The Mobis Seat is designed with portability in mind. Weighing in at just 15 pounds, the Mobis can easily be moved with the integrated handle built into the seat. 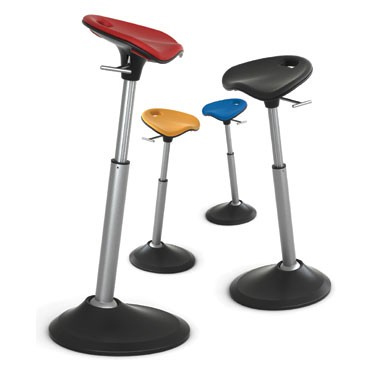 This makes it ideal for those who wish to regularly switch between the 'leaning/perching' and 'standing' positions or who wish to take it with them to co-worker's workstations, meetings, etc. Storable: Since the Mobis Seat can be lowered to 25" it can easily be stored out of the way when desired, even just tucked under the desk. Surprisingly Robust: The Mobis Seat is rated to support up to 300 lbs (136 kg).